"Sommerfeld" redirects here. For other uses, see Sommerfeld (disambiguation). Arnold Johannes Wilhelm Sommerfeld, ForMemRS (German: [ˈzɔmɐˌfɛlt]; 5 December 1868 – 26 April 1951) was a German theoretical physicist who pioneered developments in atomic and quantum physics, and also educated and mentored a large number of students for the new era of theoretical physics. He served as doctoral supervisor for many Nobel Prize winners in physics and chemistry (only J. J. Thomson's record of mentorship is comparable to his). He introduced the 2nd quantum number (azimuthal quantum number) and the 3rd quantum number (magnetic quantum number). He also introduced the fine-structure constant and pioneered X-ray wave theory. Sommerfeld studied mathematics and physical sciences at the Albertina University of his native city, Königsberg, East Prussia. His dissertation advisor was the mathematician Ferdinand von Lindemann, and he also benefited from classes with mathematicians Adolf Hurwitz and David Hilbert and physicist Emil Wiechert. His participation in the student fraternity Deutsche Burschenschaft resulted in a dueling scar on his face. He received his Ph.D. on 24 October 1891 (age 22). After receiving his doctorate, Sommerfeld remained at Königsberg to work on his teaching diploma. He passed the national exam in 1892 and then began a year of military service, which was done with the reserve regiment in Königsberg. He completed his obligatory military service in September 1893, and for the next eight years continued voluntary eight-week military service. With his turned up moustache, his physical build, his Prussian bearing, and the fencing scar on his face, he gave the impression of being a colonel in the hussars. In October 1893, Sommerfeld went to the University of Göttingen, which was the center of mathematics in Germany. There, he became assistant to Theodor Liebisch, at the Mineralogical Institute, through a fortunate personal contact – Liebisch had been a professor at the University of Königsberg and a friend of the Sommerfeld family. In September 1894, Sommerfeld became Felix Klein's assistant, which included taking comprehensive notes during Klein's lectures and writing them up for the Mathematics Reading Room, as well as managing the reading room. Sommerfeld's Habilitationsschrift was completed under Klein, in 1895, which allowed Sommerfeld to become a Privatdozent at Göttingen. As a Privatdozent, Sommerfeld lectured on a wide range of mathematical and mathematical physics topics. His lectures on partial differential equations were first offered at Göttingen, and they evolved over his teaching career to become Volume VI of his textbook series Lectures on Theoretical Physics, under the title Partial Differential Equations in Physics. Lectures by Klein in 1895 and 1896 on rotating bodies led Klein and Sommerfeld to write a four-volume text Die Theorie des Kreisels – a 13-year collaboration, 1897–1910. The first two volumes were on theory, and the latter two were on applications in geophysics, astronomy, and technology. The association Sommerfeld had with Klein influenced Sommerfeld's turn of mind to be applied mathematics and in the art of lecturing. While at Göttingen, Sommerfeld met Johanna Höpfner, daughter of Ernst Höpfner, curator at Göttingen. In October, 1897 Sommerfeld began the appointment to the Chair of Mathematics at the Bergakademie in Clausthal-Zellerfeld; he was successor to Wilhelm Wien. This appointment provided enough income to eventually marry Johanna. At Klein's request, Sommerfeld took on the position of editor of Volume V of Enzyklopädie der mathematischen Wissenschaften; it was a major undertaking which lasted from 1898 to 1926. In 1900, Sommerfeld started his appointment to the Chair of Applied Mechanics at the Königliche Technische Hochschule Aachen (later RWTH Aachen University) as extraordinarius professor, which was arranged through Klein's efforts. At Aachen, he developed the theory of hydrodynamics, which would retain his interest for a long time. Later, at the University of Munich, Sommerfeld's students Ludwig Hopf and Werner Heisenberg would write their Ph.D. theses on this topic. From 1906 Sommerfeld established himself as ordinarius professor of physics and director of the new Theoretical Physics Institute at the University of Munich. He was selected for these positions by Wilhelm Röntgen, Director of the Physics Institute at Munich, which was looked upon by Sommerfeld as being called to a "privileged sphere of action." Up until the late 19th century and early 20th century, experimental physics in Germany was considered as having a higher status within the community. However, in the early 20th century, theorists, such as Sommerfeld at Munich and Max Born at the University of Göttingen, with their early training in mathematics, turned this around so that mathematical physics, i.e., theoretical physics, became the prime mover, and experimental physics was used to verify or advance theory. After getting their doctorates with Sommerfeld, Wolfgang Pauli, Werner Heisenberg, and Walter Heitler became Born's assistants and made significant contributions to the development of quantum mechanics, which was then in very rapid development. Over his 32 years of teaching at Munich, Sommerfeld taught general and specialized courses, as well as holding seminars and colloquia. The general courses were on mechanics, mechanics of deformable bodies, electrodynamics, optics, thermodynamics and statistical mechanics, and partial differential equations in physics. They were held four hours per week, 13 weeks in the winter and 11 weeks in the summer, and were for students who had taken experimental physics courses from Röntgen and later by Wilhelm Wien. There was also a two-hour weekly presentation for the discussion of problems. The specialized courses were of topical interest and based on Sommerfeld's research interests; material from these courses appeared later in the scientific literature publications of Sommerfeld. The objective of these special lectures was to grapple with current issues in theoretical physics and for Sommerfeld and the students to garner a systematic comprehension of the issue, independent of whether or not they were successful in solving the problem posed by the current issue. For the seminar and colloquium periods, students were assigned papers from the current literature and they then prepared an oral presentation. From 1942 to 1951, Sommerfeld worked on putting his lecture notes in order for publication. They were published as the six-volume Lectures on Theoretical Physics. For a list of students, please see the list organized by type. Four of Sommerfeld's doctoral students, Werner Heisenberg, Wolfgang Pauli, Peter Debye, and Hans Bethe went on to win Nobel Prizes, while others, most notably, Walter Heitler, Rudolf Peierls, Karl Bechert, Hermann Brück, Paul Peter Ewald, Eugene Feenberg, Herbert Fröhlich, Erwin Fues, Ernst Guillemin, Helmut Hönl, Ludwig Hopf, Adolf Kratzer, Otto Laporte, Wilhelm Lenz, Karl Meissner, Rudolf Seeliger, Ernst C. Stückelberg, Heinrich Welker, Gregor Wentzel, Alfred Landé, and Léon Brillouin became famous in their own right. Three of Sommerfeld's postgraduate students, Linus Pauling, Isidor I. Rabi and Max von Laue, won Nobel Prizes, and ten others, William Allis, Edward Condon, Carl Eckart, Edwin C. Kemble, William V. Houston, Karl Herzfeld, Walther Kossel, Philip M. Morse, Howard Robertson, and Wojciech Rubinowicz went on to become famous in their own right. Walter Rogowski, an undergraduate student of Sommerfeld at RWTH Aachen, also went on to become famous in his own right. Max Born believed Sommerfeld's abilities included the "discovery and development of talents." Albert Einstein told Sommerfeld: "What I especially admire about you is that you have, as it were, pounded out of the soil such a large number of young talents." Sommerfeld's style as a professor and institute director did not put distance between him and his colleagues and students. He invited collaboration from them, and their ideas often influenced his own views in physics. He entertained them in his home and met with them in cafes before and after seminars and colloquia. Sommerfeld owned an alpine ski hut to which students were often invited for discussions of physics as demanding as the sport. While at Munich, Sommerfeld came in contact with the special theory of relativity by Albert Einstein, which was not yet widely accepted at that time. His mathematical contributions to the theory helped its acceptance by the skeptics. In 1914 he worked with Léon Brillouin on the propagation of electromagnetic waves in dispersive media. He became one of the founders of quantum mechanics; some of his contributions included co-discovery of the Sommerfeld–Wilson quantization rules (1915), a generalization of Bohr's atomic model, introduction of the Sommerfeld fine-structure constant (1916), co-discovery with Walther Kossel of the Sommerfeld–Kossel displacement law (1919), and publishing Atombau und Spektrallinien (1919), which became the "bible" of atomic theory for the new generation of physicists who developed atomic and quantum physics. 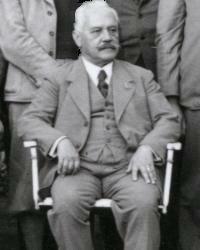 In 1918, Sommerfeld succeeded Einstein as chair of the Deutsche Physikalische Gesellschaft (DPG). One of his accomplishments was the founding of a new journal. The scientific papers published in DPG journals became so voluminous, a committee of the DPG, in 1919, recommended the establishment of Zeitschrift für Physik for publication of original research articles, which commenced in 1920. Since any reputable scientist could have their article published without refereeing, time between submission and publication was very rapid – as fast as two weeks time. This greatly stimulated the scientific theoretical developments, especially that of quantum mechanics in Germany at that time, as this journal was the preferred publication vehicle for the new generation of quantum theorists with avant-garde views. In the winter semester of 1922/1923, Sommerfeld gave the Carl Schurz Memorial Professor of Physics lectures at the University of Wisconsin–Madison. In 1927 Sommerfeld applied Fermi–Dirac statistics to the Drude model of electrons in metals – a model put forth by Paul Drude. The new theory solved many of the problems predicting thermal properties the original model had and became known as the Drude–Sommerfeld model. In 1928/1929, Sommerfeld traveled around the world with major stops in India, China, Japan, and the United States. Sommerfeld was a great theoretician, and besides his invaluable contributions to the quantum theory, he worked in other fields of physics, such as the classical theory of electromagnetism. For example, he proposed a solution to the problem of a radiating hertzian dipole over a conducting earth, which over the years led to many applications. His Sommerfeld identity and Sommerfeld integrals are still to the present day the most common way to solve this kind of problem. Also, as a mark of the prowess of Sommerfeld's school of theoretical physics and the rise of theoretical physics in the early 1900s, as of 1928, nearly one-third of the ordinarius professors of theoretical physics in the German-speaking world were students of Sommerfeld. On 1 April 1935 Sommerfeld achieved emeritus status, however, he stayed on as his own temporary replacement during the selection process for his successor, which took until 1 December 1939. The process was lengthy due to academic and political differences between the Munich Faculty's selection and that of both the Reichserziehungsministerium (REM; Reich Education Ministry) and the supporters of Deutsche Physik, which was anti-Semitic and had a bias against theoretical physics, especially including quantum mechanics. The appointment of Wilhelm Müller – who was not a theoretical physicist, had not published in a physics journal, and was not a member of the Deutsche Physikalische Gesellschaft – as a replacement for Sommerfeld, was considered such a travesty and detrimental to educating a new generation of physicists that both Ludwig Prandtl, director of the Kaiser Wilhelm Institut für Strömungsforschung (Kaiser Wilhelm Institute for Flow Research), and Carl Ramsauer, director of the research division of the Allgemeine Elektrizitäts-Gesellschaft (General Electric Company) and president of the Deutsche Physikalische Gesellschaft, made reference to this in their correspondence to officials in the Reich. In an attachment to Prandtl's 28 April 1941 letter to Reich Marshal Hermann Göring, Prandtl referred to the appointment as "sabotage" of necessary theoretical physics instruction. In an attachment to Ramsauer's 20 January 1942 letter to Reich Minister Bernhard Rust, Ramsauer concluded that the appointment amounted to the "destruction of the Munich theoretical physics tradition". As for Sommerfeld’s once patriotic views, he wrote to Einstein shortly after Hitler took power: "I can assure you that the misuse of the word ‘national’ by our rulers has thoroughly broken me of the habit of national feelings that was so pronounced in my case. I would now be willing to see Germany disappear as a power and merge into a pacified Europe." Sommerfeld was awarded many honors in his lifetime, such as the Lorentz Medal, the Max-Planck Medal, the Oersted Medal, election to the Royal Society of London, the United States National Academy of Sciences, Academy of Sciences of the USSR, the Indian Academy of Sciences, and other academies including those in Berlin, Munich, Göttingen, and Vienna, as well as having conferred on him numerous honorary degrees from universities including Rostock, Aachen, Calcutta, and Athens. He was nominated for the Nobel Prize 84 times, more than any other physicist (including Otto Stern, who got nominated 82 times), but he never received the award. In 2004, the center for theoretical physics at the University of Munich was named after him. Sommerfeld died in 1951 in Munich from injuries after a traffic accident while walking with his grandchildren. Arnold Sommerfeld, "Uber die Ausbreitung der Wellen in der Drahtlosen Telegraphie" (The Propagation of Waves in Wireless Telegraphy), Ann. Physik  28, 665 (1909); 62, 95 (1920); 81, 1135 (1926). Arnold Sommerfeld, "Some Reminiscences of My Teaching Career", American Journal of Physics Volume 17, Number 5, 315–316 (1949). Address upon receipt of the 1948 Oersted Medal. Sommerfeld, Arnold (1896). "Mathematische Theorie der Diffraction". Math. Ann. 47: 317–374. doi:10.1007/bf01447273. Arnold Sommerfeld and Hans Bethe, Elektronentheorie der Metalle, in H. Geiger and K. Scheel, editors Handbuch der Physik Volume 24, Part 2, 333–622 (Springer, 1933). This nearly 300-page chapter was later published as a separate book: Elektronentheorie der Metalle (Springer, 1967). ^ a b Born, Max (1952). "Arnold Johannes Wilhelm Sommerfeld. 1868-1951". Obituary Notices of Fellows of the Royal Society. 8 (21): 274–296. doi:10.1098/rsbm.1952.0018. JSTOR 768813. ^ Hoddeson, Lillian; Daitch, Vicki (28 Oct 2012). True Genius: The Life and Science of John Bardeen. Joseph Henry Press. ISBN 978-0309095112. Retrieved 12 May 2016. ^ The Mathematics Genealogy Project (Arnold Sommerfeld Archived 2006-10-17 at the Wayback Machine) cites Ferdinand von Lindemann as Sommerfeld's Ph.D. dissertation advisor. Cassidy (Cassidy, 1992, pp. 100 – 101) cites Paul Volkmann as Sommerfeld's advisor and cites a reference. Other authors provide information which can be used to decide between the two, in view of Sommerfeld's abilities. The English translation of Sommerfeld's Habilitationsschrift (Arnold Sommerfeld, translated by Raymond J. Nagem, Mario Zampolli, and Guido Sandri Mathematical Theory of Diffraction, Birkhäuser Boston, 2003, pp. 1–2) reveals that Sommerfeld's Ph.D. thesis cited 14 of his teachers at the University of Königsberg and thanked all of them, but particularly named Lindemann in the line of gratitude. Jungnickel (Jungnickel, 1990b, pp. 144–148 and 157–160) is revealing on a number of issues relating to Volkmann. He did little research himself, did not attract physicists, had few publications to his name, and as a physics teacher was a "popularizer". While Sommerfeld attended classes in Volkmann's Theoretical Physics Institute at Königsberg, he looked to Volkmann's assistant Emil Wiechert, rather than Volkmann himself. Sommerfeld was closely associated with Emil Wiechert, who gave him many impressions. Wilfried Schroeder has published the earlier letters between Sommerfeld and Wiechert (Arch. hist. ex. sci., 1984). At the end of the 19th and the early 20th century, there were only four ordinarius professorships for theoretical physics: Königsberg (Volkmann), Göttingen (Woldemar Voigt), Berlin (Max Planck), and Munich, which had been vacant since Ludwig Boltzmann left in 1894, and would not be filled until Sommerfeld was appointed there in 1906. In comments made on the status of theoretical physics in 1899, Voigt only mentioned Planck, Wilhelm Wien, Paul Drude, and Sommerfeld. In a letter to Sommerfeld in 1898, Wien's assessment was similar to Voigt's; Wien only mentioned the chairs at Berlin and Göttingen. Keeping in mind that Munich was unfilled, not mentioning Volkmann's chair at Königsberg to Sommerfeld was a glaring omission, with implications. ^ a b c Mehra, Volume 1, Part 1, 1982, p. 106. ^ Arnold Sommerfeld Archived 2006-10-17 at the Wayback Machine – Mathematics Genealogy Project. Sommerfeld's Ph.D. thesis title: Die willkürlichen Functionen in der mathematischen Physik. ^ A curator was the resident government representative at the university. ^ Jungnickel, 1990b, pp. 274, 277–278, and 281–285. ^ Jungnickel, 1990b, pp. 157 – 160, 254 ff., 304 ff., and 384 ff. ^ Cassidy, 1992, p. 104. Doctoral: Karl Apfelbacher, Hermann Brück, Paul Sophus Epstein, Johannes Fischer, Walter Franz, Herbert Fröhlich, Erwin Fues, Karl Glitscher, Frederick Grover, Ernst Guillemin, Werner Heisenberg, Demetrius Hondros, Helmut Hönl, Ludwig Hopf, Alfred Landé, Herbert Lang, Otto Laporte, Karl Meissner, Josef Meixner, Heinrich Ott, Wolfgang Pauli, Edward Ramberg, Valentin Scheidel, Otto Scherzer, Rudolf Seeliger, Ernst C. Stückelberg, and Albrecht Unsöld. Doctoral completing requirements elsewhere: Léon Brillouin, Eugene Feenberg, Rudolf Peierls, and Francis G. Slack. Doctoral with Sommerfeld as secondary advisor and the primary advisor annotated in parentheses: Friedrich Burmeister – (Hugo von Seeliger), Walter Heitler – (Karl Herzfeld), Karl Herzfeld – (Friedrich Hasenöhrl), Herman March – (Wilhelm Röntgen), Kurt Urban – (Wilhelm Rabe), Karl Seebach – (Heinrich Tietze), and Bruno Thüring – (Alexander Wilkens). Doctoral and Habilitation: Karl Bechert, Hans Bethe, Peter Debye, Paul Peter Ewald, Adolf Kratzer, Wilhelm Lenz, Ludwig Waldmann, Heinrich Welker, and Gregor Wentzel. Habilitation: Walther Kossel, Max von Laue, and Wojciech Rubinowicz. Postdoctoral: William Allis, Boyd Bartlett, Richard Becker, Edward Condon, Carl Eckart, William V. Houston, Edwin C. Kemble, Philip M. Morse, Karel Niessen, Linus Pauling, Isidor Rabi, Howard Robertson, and Fritz Sauter. Undergraduate at Aachen: Walter Rogowski. ^ Arnold Sommerfeld’s Students Archived 2006-10-17 at the Wayback Machine – The Mathematics Genealogy Project and Arnold Sommerfeld – Kommunikation und Schulenbildung Archived 2007-06-15 at the Wayback Machine. ^ Peierls spent 1926–1928 in doctoral studies under Sommerfeld. He then went on to finish his Ph.D. under Wolfgang Pauli, at the University of Leipzig; it was granted in 1929. See: American Philosophical Society Author Catalog: Peierls Archived 2007-02-05 at the Wayback Machine. ^ Eugene Feenberg did doctoral studies with Sommerfeld and completed his Ph.D. in 1933 under Edwin C. Kemble at Harvard University. ^ After one year at Munich studying with Sommerfeld, Karl Meissner returned to Tübingen to be able to study spectroscopy with Friedrich Paschen, under whom he received his doctorate in 1915. See: K. W. Meissner reviews: Arnold Sommerfeld, translated from the first German edition by Otto Laporte and Peter A. Moldauer Optics – Lectures on Theoretical Physics Volume IV. American Journal of Physics 23 (7) 477–478 (1955). The author states that he attended Sommerfeld's lectures, and specifically on optics, in 1912. ^ In 1912–1913, Brillouin did graduate work with Sommerfeld. He went on to earn his Doctor d'État ès Sciences in 1920, at the University of Paris, under Paul Langevin. See: American Philosophical Society Author Catalog: Brillouin Archived 2007-02-05 at the Wayback Machine. ^ Through a National Research Council fellowship in 1925–1926 and a Guggenheim Foundation fellowship in 1926–1927, Pauling accomplished postgraduate work with Sommerfeld, Erwin Schrödinger in Zurich, and Niels Bohr in Copenhagen. See: Nobel Prize Biography: Pauling Archived 2007-06-20 at the Wayback Machine. See also: Arnold Sommerfeld Some Reminiscences of My Teaching Career, American Journal of Physics 17 315–316 (1949). In the article, Sommerfeld specifically mentions as his (postdoctoral) students the Americans Linus Pauling, Edward U. Condon, and I. I. Rabi. ^ After earning his Ph.D. in 1927, Rabi, aided by fellowships, went to Europe for two years to do postgraduate work under Sommerfeld, Niels Bohr, Wolfgang Pauli, Otto Stern, and Werner Heisenberg. See: Isidor Isaac Rabi - Biographical Archived 2012-10-02 at the Wayback Machine. See also: Arnold Sommerfeld Some Reminiscences of My Teaching Career, American Journal of Physics 17 315–316 (1949). In the article, Sommerfeld specifically mentions as his (postdoctoral) students the Americans Linus Pauling, Edward U. Condon, and I. I. Rabi. See also: I. I. Rabi, translated and edited by R. Fraser Code Stories from the early days of quantum mechanics, Physics Today (8) 36–41 (2006). In the article, Rabi comments on his experience as a postdoctoral student of Sommerfeld. ^ Walker, 1995, p. 73. Von Laue completed his Habilitation in 1906. ^ During the 1930–1931 academic year, Allis spent the first half with Sommerfeld and the last half at the University of Cambridge. He was traveling with Philip M. Morse. See: Philip M. Morse In at the Beginnings: A Physicists Life (MIT Press, second printing 1978) p. 100. ^ After earning his Ph.D., Condon, in 1926 and 1927, on a National Research Council fellowship, funded by the Rockefeller Foundation, did postgraduate work with Sommerfeld in Munich and Max Born in Göttingen. See: American Institute of Physics: Edward Condon Archived 2006-12-06 at the Wayback Machine and American Philosophical Society –MOLE: Condon Archived 2006-09-27 at the Wayback Machine. See also: Arnold Sommerfeld Some Reminiscences of My Teaching Career, American Journal of Physics 17 315–316 (1949). In the article, Sommerfeld specifically mentions as his (postdoctoral) students the Americans Linus Pauling, Edward U. Condon, and I. I. Rabi. ^ In 1927 and 1928, Eckart had a Guggenheim Fellowship, which he used to go to Germany to do postgraduate study with Arnold Sommerfeld at the Ludwig Maximilians University of Munich and Werner Heisenberg at the University of Leipzig. Eckart Biography – The National Academies Press and Author Catalog: Eckart Archived 2007-02-05 at the Wayback Machine – American Philosophical Society. See also Arnold Sommerfeld, Some Reminiscences of My Teaching Career, American Journal of Physics 17 (5) 315–316 (1949). ^ Edwin C. Kemble went to Munich and Göttingen in 1927–1928 to study and do research with Sommerfeld and Max Born, respectively. ^ In 1927 and 1928, Houston had a Guggenheim Fellowship, which he used to go to Germany to do postgraduate study with Sommerfeld at the Ludwig Maximilians University of Munich and Werner Heisenberg at the University of Leipzig. Houston Biography Archived 2007-03-24 at the Wayback Machine – The National Academies Press. See also Arnold Sommerfeld Some Reminiscences of My Teaching Career, American Journal of Physics 17 (5) 315–316 (1949). ^ Herzfeld worked at the University of Munich with Sommerfeld and Kazimierz Fajans, first as a Privatdozent (from 1919 to 1925) and then as an extraordinary professor (from 1925-1926). See: Karl Ferdinand Herzfeld 1892-1978 Archived 2015-09-12 at the Wayback Machine, A biographical memoir by Joseph F. Mulligan, National Academy Press, 2001. ^ Paul Kirkpatrick Address of Recommendation by Professor Paul Kirkpatrick, Chairman of the Committee on Awards, American Journal of Physics 17 (5) 312–314 (1949). In this article, the following students of Arnold Sommerfeld are mentioned: William V. Houston, Karl Bechert, Otto Scherzer, Otto Laporte, Linus Pauling, Carl Eckart, Gregor Wentzel, Peter Debye, and Philip M. Morse. ^ Philip M. Morse In at the Beginnings: A Physicists Life (MIT Press, second printing 1978) p. 100. ^ I. I. Rabi, translated and edited by R. Fraser Code Stories from the early days of quantum mechanics, Physics Today (8) 36–41 (2006) p. 38. ^ Rubinowicz was at Munich from 1916 to 1918. ^ a b Jungnickel, 1990b, p. 284, quoting from references given in Footnote 100 on the page. ^ Jungnickel, 1990b, p. 283. ^ Mehra, 1982, Volume 1, Part 1, p. 330. ^ Kragh, 2002, p. 155. ^ Cassidy, 1992, p. 106. ^ Kragh, 2002, pp. 150 and 168. ^ Beyerchen, 1977, p. 9, citing the following reference: Max Born Sommerfeld als Begründer einer Schule, Die Naturwissenschaften 16 1036 (1928). ^ Beyerchen, 1977, pp. 150–167. ^ In 1935, the Munich Faculty drew up a candidate list to replace Sommerfeld as ordinarius professor of theoretical physics and head of the Institute for Theoretical Physics. There were three names on the list: Werner Heisenberg, who received the Nobel Prize in Physics in 1932, Peter Debye, who would receive the Nobel Prize in Chemistry in 1936, and Richard Becker – all former students of Sommerfeld. The Munich Faculty was firmly behind these candidates, with Heisenberg as their first choice. However, supporters of Deutsche Physik and elements in the Reichserziehungsministerium had their own list of candidates and the battle commenced, dragging on for over four years. During this time, Heisenberg, came under vicious attack by the supporters of Deutsche Physik; one such attack was published in Das Schwarze Korps, the newspaper of the Schutzstaffel, or SS, headed by Heinrich Himmler. At one point, Heisenberg's mother visited Himmler's mother to help bring a resolution to the affair. The two women knew each other as a result of Heisenberg's maternal grandfather and Himmler's father being rectors and members of a Bavarian hiking club. Fortunately, the Heisenberg affair was settled with a victory for academic standards and professionalism, however, with Wilhelm Müller taking over for Sommerfeld on 1 December 1939, it was a political victory over academic standards. See: Beyerchen, 1977, pp. 153–167; Cassidy, 1992, pp 383 – 387; Powers, Thomas, Heisenberg's War: The Secret History of the German Bomb (Knopf, 1993), pp. 40–43; Hentschel, 1996, pp. 176–177; and Goudsmit, Samuel A. ALSOS (Tomash Publishers, 1986) pp 117–119. ^ Beyerchen, 1977, p. 166. ^ Hentschel, 1996, p. 265. Document #85 in Hentschel, 1996, pp. 261–266. ^ Hentschel, 1996, p. 291. Document #93 in Hentschel, 1996, pp. 290–292. ^ Hentschel, 1996, Appendix F; see entries for Carl Ramsauer and Ludwig Parndtl. ^ Kirkpatrick, Paul (1949). "Address of Recommendation by Professor Paul Kirkpatrick, Chairman of the Committee on Awards". American Journal of Physics. 17 (5): 312–314. Bibcode:1949AmJPh..17..312.. doi:10.1119/1.1989584. ^ Sommerfeld, Arnold (1949). "Some Reminiscences of My Teaching Career". American Journal of Physics. 17 (5): 315–316. Bibcode:1949AmJPh..17..315S. doi:10.1119/1.1989585. ^ "Nomination Database". www.nobelprize.org. Archived from the original on 6 November 2016. Retrieved 4 May 2018. ^ "Nomination Database". www.nobelprize.org. Archived from the original on 12 February 2018. Retrieved 4 May 2018. ^ Crawford, Elisabeth (November 2001). "Nobel population 1901-50: anatomy of a scientific elite". Physics World. Archived from the original on 3 February 2006. ^ "University of Texas Cécile DeWitt-Morette December 21 1922–May 8, 2017". The History of the University of Texas at Austin Department of Physics. [letter from] PROF. DR. W. PAULI. Retrieved 2019-02-19. Just now I had a sad experience: my old teacher Sommerfeld died this week in Munich as a consequence of a street accident in the age of 82. Kirkpatrick, Paul, Address of Recommendation by Professor Paul Kirkpatrick, Chairman of the Committee on Awards, American Journal of Physics Volume 17, Number 5, pp. 312–314 (1949). Address preceding award to Arnold Sommerfeld, recipient of the 1948 Oersted Medal for Notable Contributions to the Teaching of Physics, 28 January 1949. O'Connor, John J.; Robertson, Edmund F., "Arnold Sommerfeld", MacTutor History of Mathematics archive, University of St Andrews . A collection of digitized materials related to Sommerfeld's and Linus Pauling's structural chemistry research. This page was last edited on 4 April 2019, at 16:50 (UTC).